"Imagine Anna Quindlen or Sue Miller turning her attention to writing a young adult novel, and you have an idea what [Williams] has done for early teen readers..." --Audrey Couloumbis, author of the Newbery Honor Book Getting Close to BabyThirteen-year-old Lacey wakes to a beautiful summer morning excited to begin her new job at the library, just as her mother is supposed to start work at the grocery store. Lacey hopes that her mother's ghosts have finally been laid to rest; after all, she seems so much better these days, and they really do need the money. But as the hours tick by and memories come flooding back, a day full of hope spins terrifyingly out of control...."No one can get inside the head and heart of a 13-year-old girl better than Carol Lynch Williams, and I mean no one," said James S. Jacobs, Professor of Children's Literature at Brigham Young University, of her breakout novel, The Chosen One. Now this award-winning YA author brings us an equally gripping story of a girl who loves her mother, but must face the truth of what life with that mother means for both of them. 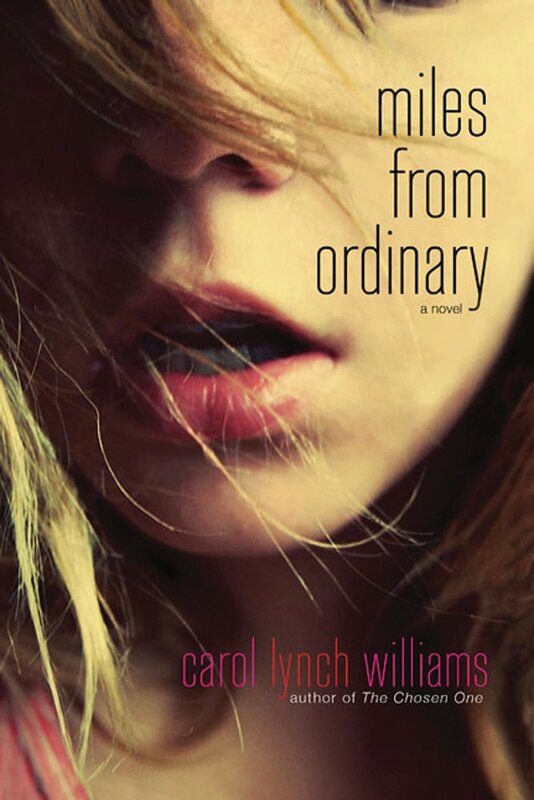 Miles From Ordinary by Carol Lynch Williams is an incredibly short book, one of those reads you could easily finish in an afternoon, with short chapters as well. I thought that Miles From Ordinary was one of those books that could pass as either middle grade or young adult. It opens with fourteen year old protagonist Lacey feeling optimistic toward her new job as a library volunteer over the summer. Lacey’s mom also has a new job, as a cashier at Winn-Dixie. Lacey hopes that everything will go off without a hitch and that she’ll make a new friend and won’t feel so lonely anymore. There’s just one problem, Lacey’s mom is certifiably nuts. Taking place over 24 hours, Miles From Ordinary had me glued to the pages and nervous. See, whenever a crazy person shows up I can’t look away from the page. I found myself hoping that everything would turn out alright for Lacey. While I didn’t connect with her, I recognized her hard lot in life. I mean, YOU GUYS, her mom buys food to stock up for the apocalypse and is also pretty sure that Lacey’s dead grandfather is talking to her. So, that’s a ton of INSANE to deal with. Like, Lacey’s mom does a bunch of crazy things because she thinks her father is telling her to do it. Plenty of weird things go down. I wasn’t prepared for the WTF moments because I guess I was expected a warm and fuzzy contemporary, judging by the big face on the cover. BAHAHAHHA. I WAS WRONG. Miles From Ordinary by Carol Lynch Williams has some freaking creepy scenes. And well, it’s a great thing that I love to be scared, because otherwise I would have set the book down. Like, it gets real, you guys. And I think if you like to be creeped out while reading and maybe jump a little, you’ll be down with Miles From Ordinary. While Miles From Ordinary by Carol Lynch Williams isn’t the greatest book I’ve read and while I never connected with Lacey, it’s not a bad read. If you are in the mood for freaky without paranormal creatures, then you should totally check this book out. I have a hardcover edition that I would be thrilled to give to a random commenter. Just leave a comment on this post. This is open internationally. I will pick and contact a winner March 30 and announce it this post rather than make a new one. And the winner is: ashelynn hetland yayyy! A fourteen year old protagonist is a bit young for me, but the book sounds pretty interesting. Nice review! I am intrigued now – especially since you say it could be middle grade or YA. I love books like that since my 6th graders are at that stage where they’re not middle grade but they’re not YA either. I really enjoy her books…you might try another to see what you think. I love crazy people in books too. You can always count on their scenes being interesting and often mind-blowing. I love that this book has its creepy moments. I haven’t read anything scary in quite some time and I’m itching for something freaky. I never expected this book to be creepy. I haven’t read anything by Carol Lynch Williams, but considering that my students keep telling me to buy more “scary” books, I’ll have to read this one soon. Thanks for the review! She stocks up for the apocalypse? Have you watched Doomsday Preppers? If you like that kind of crazy…the doomsday preppers are definitely crazy. This one definitely has a fuzzy vibe so it’s interesting that it’s filled with WTF moments…very unexpected. I definitely DO NOT love to be scared. It’s just not fun at all. But, I can get behind crazy creepy. I don’t know, I’m weird like that. Glad you enjoyed it April! Sounds like a very good book, thanks for the chance to win! I put this book on my TBR not too long ago so I’m glad to see your review of it! Hope to read it quite soon. Sounds super interesting! I’ll have to check it out. Thanks a bunch this book sounds a little creepy but so good. I recently purchased an eBook version of one ofCarol Lynch William’s other books, The Chosen One. I haven’t read it yet, but I like the themes the author touches upon and this one is on my list of books I want to read. I’d love to win this book and see what creepy scenes you are talking about. It sounds like quite the ride, even if it is hard to connect to the characters! Wow! I didn’t know you could yodel!